Energy. Jeremy Grantham covered the subject well during his recent interview with Charlie Rose. Our selection of National Oilwell Varco (NOV) comes closely on the heels of Atwood Oceanics (ATW) a few months ago. The energy and energy-related stocks (i.e. Schlumberger) keep appearing at the top of our screens — and we’re wary to ignore this condition. EMC Corp (EMC) and Apple (AAPL) were honorable mention candidates and accounted for the other half of Grantham’s core message for long-term investors. The company is the largest provider of equipment for oil and gas drilling. 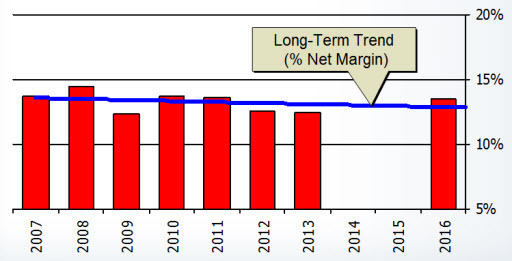 The long-term outlook is bright for National Oilwell Varco. From North Dakota to Pennsylvania to the Gulf waters off the coast of Brazil … the global need for energy is a compelling driver. 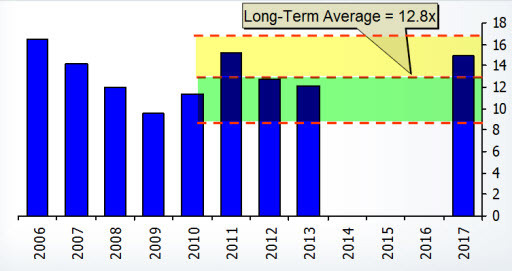 The Manifest Investing sales growth forecast for NOV is 10.5%. (Keep in mind that any historical data prior to 2009 is disrupted by the GrantPrideCo acquisition.) We’re using 12.8% for the projected net margin. The median P/E for the period 2006-2016 is 12.8×. We’re using 12x for the projected average P/E. At the time of selection (4/3/2013), the stock price is $67.98, the projected annual return is 14%. The quality RANKING is 80 (Good) and the financial strength rating is 92 (A+). The company has less long-term debt than cash assets and has an effective interest rate of 3.35%. S&P views NOV as an attractive play on the need for new rig equipment, particularly for deepwater and unconventional natural gas projects.